It’s always interesting when different stories I’ve been following come together. 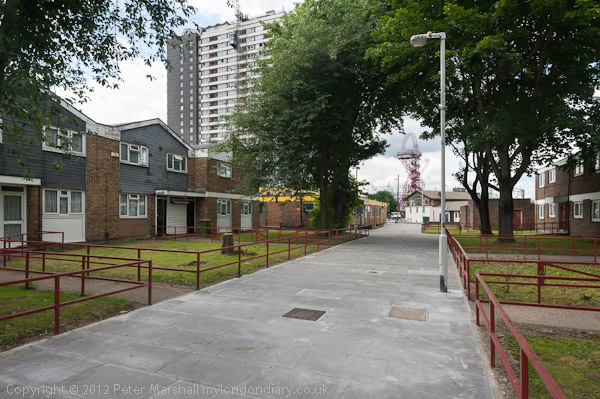 I first got to know the Carpenters Estate when I was photographing around the River Lea and the navigation and back rivers in the 1980s, though I don’t recall actually taking pictures as I walked through. 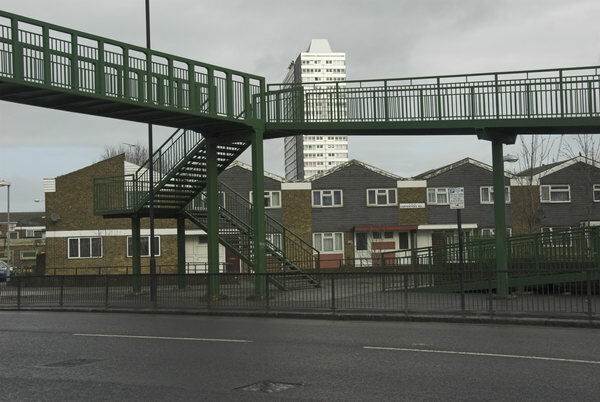 It wasn’t really the kind of subject matter that particularly interested me at the time – a quiet, well planned and solidly built post-war council estate with three point blocks – that just happened to be on my route to and from Stratford station. I photographed a few things around its edges – the footbridge over the railway became a part of my Greenwich Meridian project (along with the then new Stratford Bus station) in the 1990s, along with the deserted rivers and canals and pockets of thriving industry to the north and west. If one had wanted a textbook example of a council estate that worked and that people were happy to live on, this would have served. But in the early years of this century things changed dramatically. Newham got involved with the London Olympic bid, and suddenly this large area on the Olympic fringe became for the council a very desirable investment opportunity rather than a successful social housing. Of course they had to find a reason for wanting to close the estate. Like everything else built in the 1960s, the buildings – and particularly the point blocks – contained asbestos. Mostly of course this remains entirely safe unless disturbed (I write looking out over an asbestos roof.) But it was a good enough excuse, and with a report saying it was too expensive to remove it, they started the process of clearing out tenants from the estate. Most if not all the tenants were persuaded in various ways to leave, but many of the residents had taken advantage of the ‘right to buy’ and were (and are) keen to stay on. 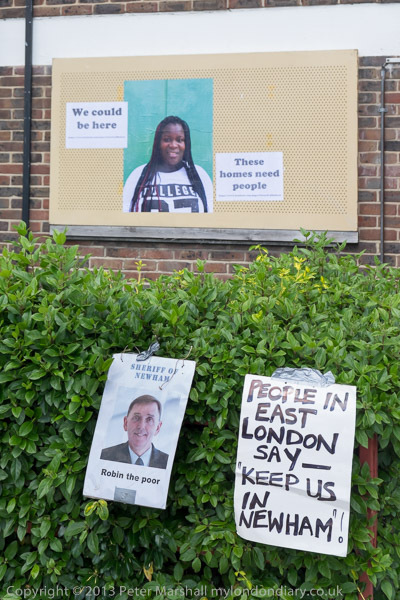 Residents formed an action group and were active in the estate tenants management organisation – until the council rigged the elections to this and disqualified most of them. So the estate has now had perfectly sound, safe properties empty and sealed up, some now empty for eight years, while Newham has one of the largest housing problems in London. Newham Council’s next plan was to sell the whole area to University College London for a new campus, possibly retaining some of the large buildings for student residences. And somehow, magically, it became possible to clean out that asbestos. I came back to Carpenters just before the Olympics for a tour organised by local residents in Carpenters Against Regeneration Plans (CARP), which ended with a farce as security men employed by the BBC attempted to refuse residents (and their guests including myself) entry to tower block Lund Point where the BBC were using some empty flats for their Olympic coverage. At first police and PCSOs supported the BBC, but later more senior officers told the BBC heavies they had to let us in. We had another fight with them to get to visit a second flat on the 20th floor. 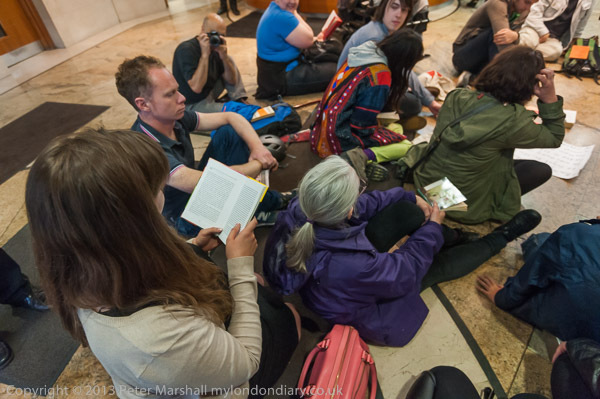 Now, thanks in part to protests by students and academics as well as local opposition, the UCL plan has fallen through, and the council for the moment appears to be allowing some short-term tenancies on the estate, probably before selling parts off for piece-meal private development. Meanwhile many in Newham are desperate for housing and unable to afford the increasingly stratospheric prices and rents being asked for the new properties being built by private developers, selling mainly to wealthy employees in the City, a short train or bus ride away. 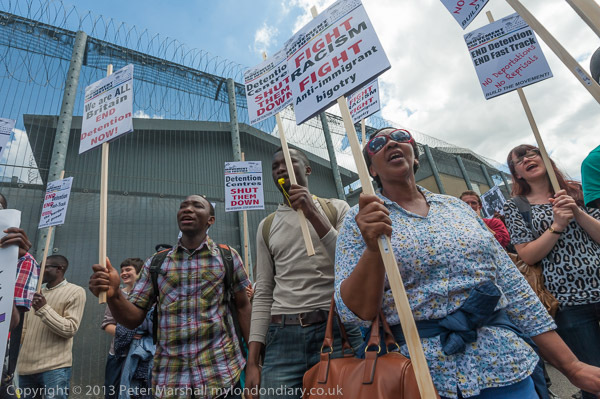 Newham residents are being forced out of the area – the poor are no longer welcome in the borough. Among those the council has tried to force out are a small group of mothers and children who were living in the Focus E15 hostel, who got together after being told they were to be evicted and stood up and fought when they found the council wanted to send them away to Birmingham and elsewhere, away from families, jobs, courses and support. Mayor of Newham Robin Wales on a poster ‘Sheriff of Newham – Robin the poor’. 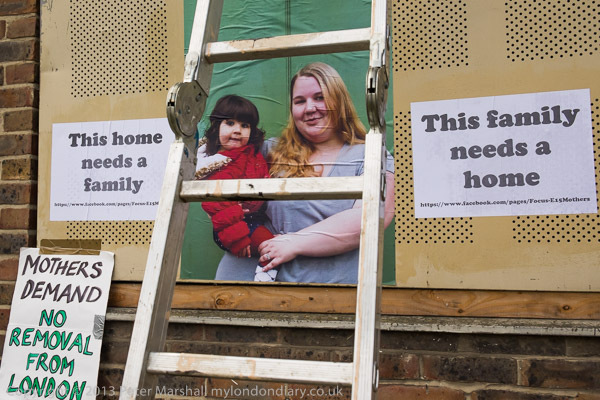 Their lively campaign has horrified Newham councillors and inspired many others in housing need, and has become a much more general campaign against what they describe as ‘social cleansing’. 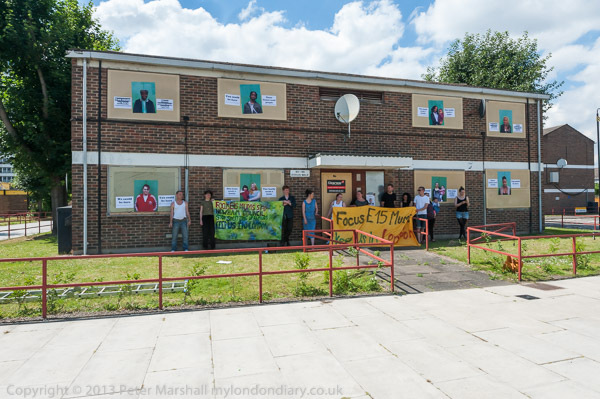 The E15 mums and others on Newham’s housing lists would love to be rehoused in the empty properties on the Carpenters estate (or other empty council properties in the area) and came to make that point, bringing photographs of themselves and their children along with other posters and paste. 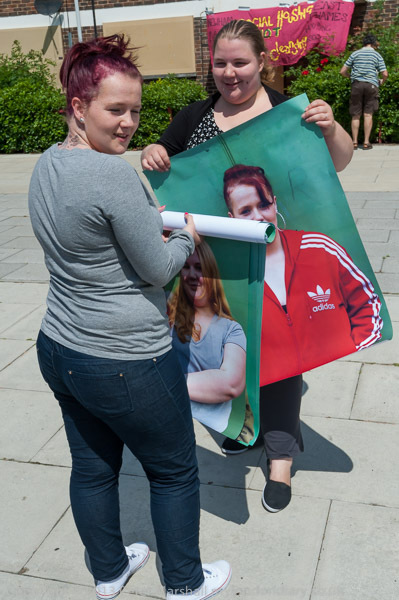 Jasmin and her daughter look out from a poster. I photographed them putting up the posters on empty properties surrounding a square on the estate, where they were joined by a few residents and former residents. One of them lent them a ladder so they could put up posters on the first floor too. The posters speak for themselves – and it wasn’t very long after the protest before the council, annoyed by the publicity, sent workmen along to take them down. Photographically I had a problem. Overall images – like that at the top of this post – left the posters and banners too small to read in any size likely to be used in a newspaper or magazine, and I found the red railings in front of the block too obtrusive, but I didn’t really manage to find another single image that represented the protest. There were quite a few pictures that I liked, but I did rather feel I had failed to solve the problem. 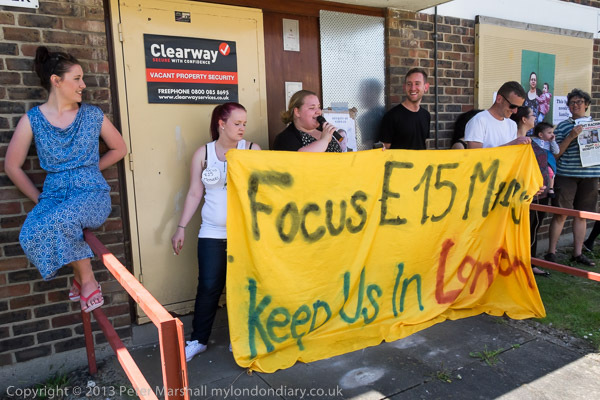 See for yourself at Focus E15 Mums Expose Carpenters Estate. I’d gone to Marble Arch thinking I was going to photograph a protest, but ended up along with a few other photographers and the public being in the way on a film set. Of course most protests are to some extent organised, but this was one that was being choreographed, and it made me feel uneasy. In part it is the spontaneity of much protest that attracts me to it, and I shiver a little at seeing highly controlled and organised events – whether in North Korea or for the Olympics. Of course the issues behind the protests are important, and the clampdown by the Egyptian courts with 1,212 death sentences truly reprehensible, even to those who supported the military in their removal of former president Morsi. The figure of 1,212 comes from two mass trials. 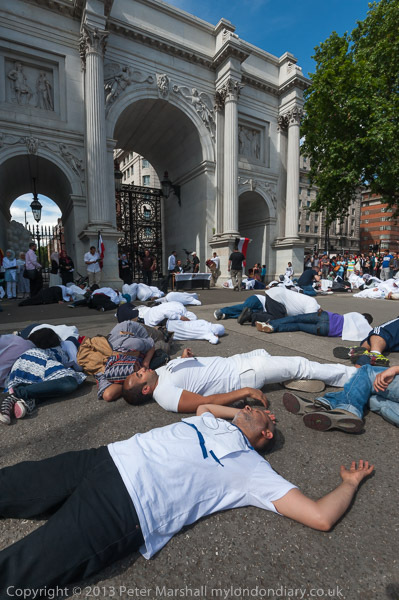 At the time of this protest/video, around 720 of the 1212 remained under sentence of death, as of the 529 sentenced in March, 429 had their death penalty reduced to life sentences for 492 on June 1, a week earlier. Of the 683 sentenced in April, the death sentences against between 180 and 200 were confirmed later in June after this protest and almost 500 were acquitted, reducing the number to something over 200. 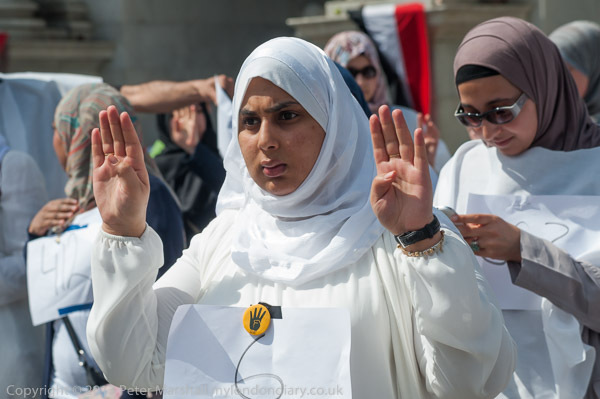 There are also a number of other cases against smaller groups of supporters of the Muslim Brotherhood, mainly for those accused of specific violent crimes against individuals. Although the number of sentences remains shocking, and the initial sentences clearly political (and many of us oppose the death penalty under all circumstances), it is likely that they will mainly be carried out where there is specific evidence of criminal behaviour. All death sentences in Egypt are subject to review by the Grand Mufti, Egypt’s highest religious authority and subject to a final decision by the President. It was clear from the start that there was something slightly unusual about this event, and that the organisers had not managed to get the support they needed. 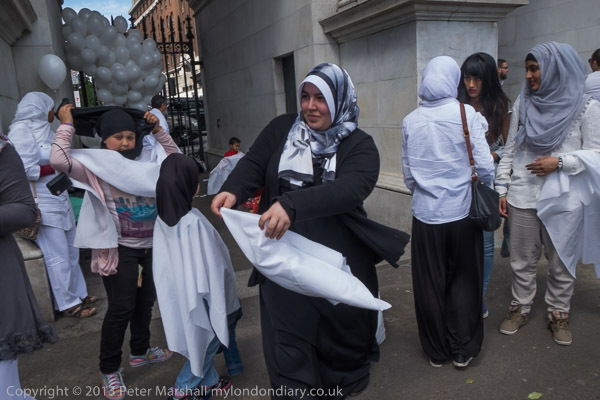 They had wanted at least 1,212 protesters but had only around a tenth of that number, and their plans to dress them all in white with a number on each person had clearly not quite materialised. It was a protest that never really got going, with people hanging around until they were told to get into position for the next scene – film extras rather than protesters. I’d left the scene long before most of what ended up in the video was taken and am pleased to say that I don’t think I appear in the video that resulted on and I’m afraid for all the seriousness of what is happening in Egypt I find it a little amusing in a way that was unintended. Of course I didn’t want to get in the way and that was just too much of a restriction on what I was able to do. I left before any use was made of the white balloons you see in the video which might have provided some photographic interest. Large parts of the action that was filmed make no appearance on the video, which repeats a number of times the judge banging his gavil and sections of the crowd falling. This wasn’t something that worked well in still images, and very few that I took made it the the edited set you can see at Protest Against Egypt Death Sentences. The news from Gaza has certainly been shocking, with now well over a thousand Palestinians, mostly innocent civilians, including many children now known to be killed. Of course we should grieve too for the Israelis who have died – mainly soldiers – but the figures point to the disproportionality – this is not a war but an entirely out of proportion one-sided punishment of the population of Gaza. The consequences of the attacks on heavily populated city areas with the weapons being used – even if every one was accurately targeted – are inevitably large numbers of civilian deaths. If you’ve not seen it, watch Jon Snow‘s report which makes this crystal clear – though it does contain some disturbing images. I was pleased I wasn’t watching in HD. Although I don’t find it easy to look at the pictures and videos which are coming out from Gaza, I think it is important that brave journalists are going there and sending them out. Today I read that another journalist I admire, Paul Mason, is now in Gaza and reporting for Channel 4. One of the sets of photographs which brings home what is happening there to me appeared a few days ago in Time Lightbox, Innocents in the Crossfire: Alessio Romenzi’s Shocking Photographs From Gaza, work by a 40 year old Italian photographer who has spent the last five years in Israel and Palestine. There isn’t a great deal of gore in the images, though an enormous amount of destruction in the background, but for me they bring me very close to the people who are suffering in Gaza. By the time you read this, the figures for deaths will doubtless be higher. Surely it must be time for peace. You can see more of Romenzi’s work from Gaza and elsewhere on his Photoshelter site. 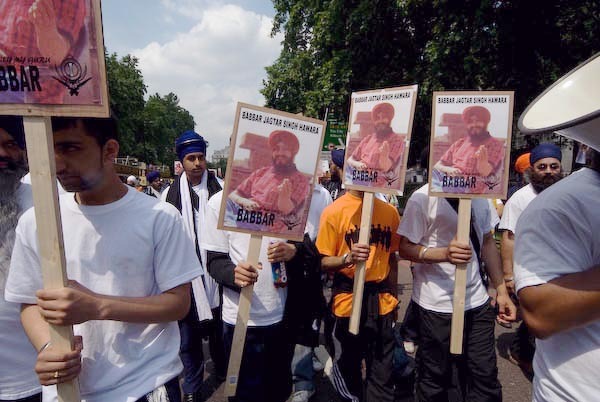 It was I think in 2004, on the 20th anniversary of Operation Bluestar, when Indian troops invaded the Golden Temple as Amritsar, killing several thousand Sikhs that I first attended and photographed the annual Sikh Freedom march in London, and I wrote about the issues for the first time on My London Diary. 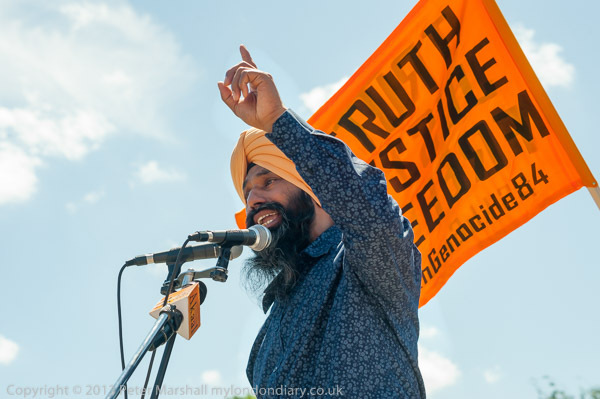 Then, a number of British politicians came to give their support, but since then it has been an almost entirely Sikh event, which I’ve photographed most years when I’ve been in London at the right time. The pictures I took then have a rather faded look to them, though that is more a reflection of my own changing tastes and the particular RAW software I was using at the time than their age. Going back to the RAW files now I would certainly get a rather more punchy result. 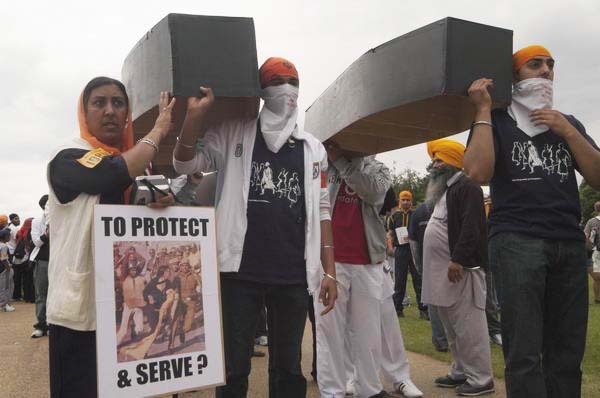 It is an event that has changed just a little over the years, at times becoming more overtly political in its support of Sikh militants fighting for freedom. In 2006 some of the police made quite an effort to harass photographers – including me – who were trying to photograph the event. 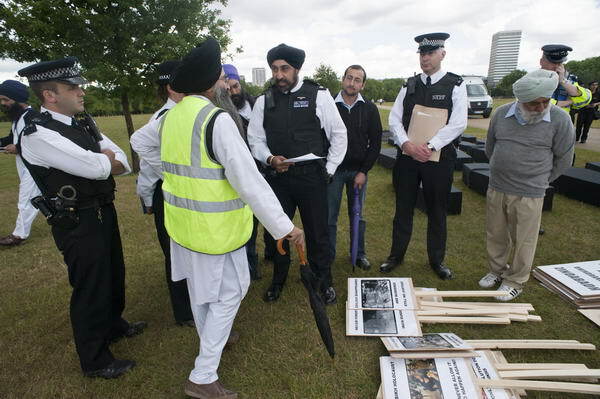 In 2007 there was a large group of supporters of Babbar Khalsa the Khalistani militant armed organization which both India and the UK regard as a terrorist organisation on the march, perhaps why in 2009 the Met brought in a Sikh officer to censor the placards carried on the protest. The placards since then have been a little less explicit and In 2014 I saw no problems with police. 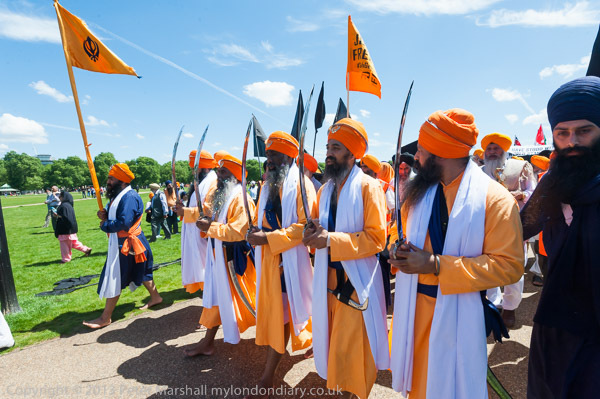 This year’s event followed the same pattern as previous years, with a long rally in a hot and sunny Hyde Park, followed by a march led by five Khalsa in their saffron robes with their ceremonial sword and with black flags and coffins behind them followed by a great mass of protesters. It was perhaps a little larger than in some years, and there did seem to be more large banners calling for freedom and an end to the genocide by India. 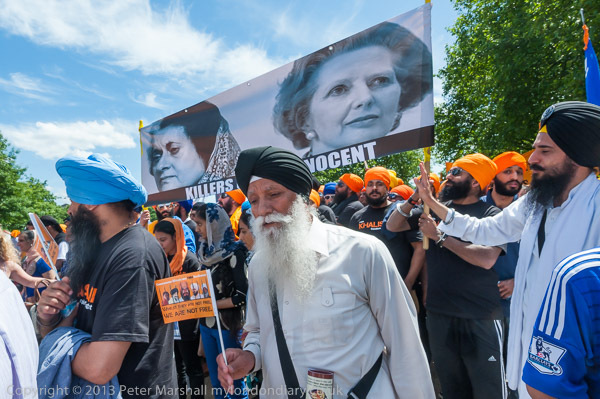 These included some with the message ‘Thatcher has Sikh Blood on her Hands’ while another showed two huge portraits of the villains, Thatcher and Indira Gandhi with the message ‘Killers of the Innocent’. 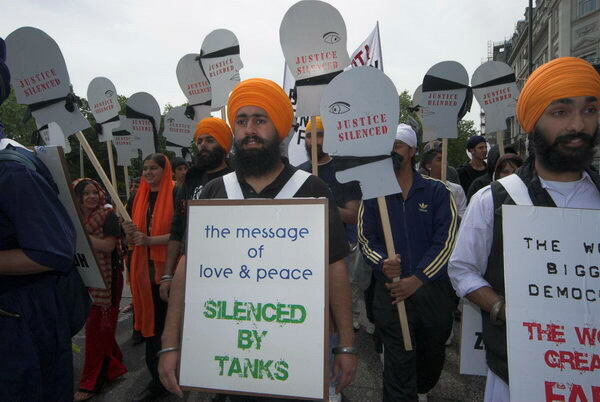 More pictures from 2014 at Sikhs march for Truth, Justice & Freedom. 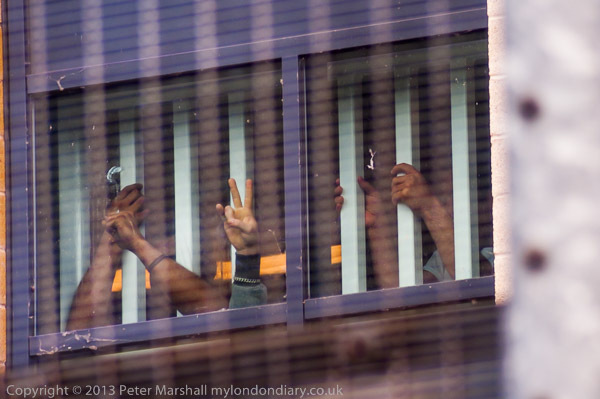 I’ve several times photographed protests outside one of Britain’s immigration prisons – though we don’t officially call them that, and those detained inside have some freedoms denied to prisoners in our other jails. So when the protesters arrived outside the buildings they were able to contact some of the prisoners inside over mobile phones. 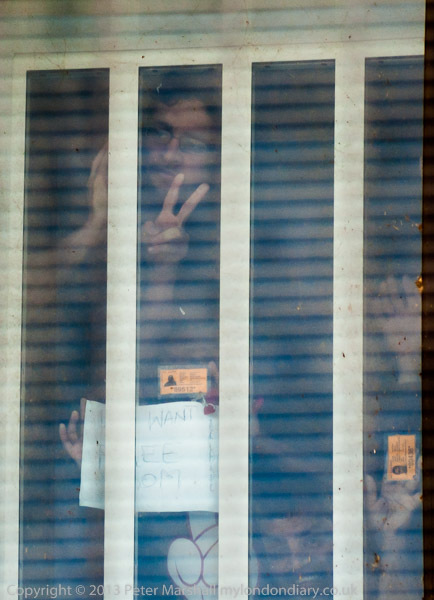 In the picture above, two prisoners are speaking to the protesters outside over the phone. 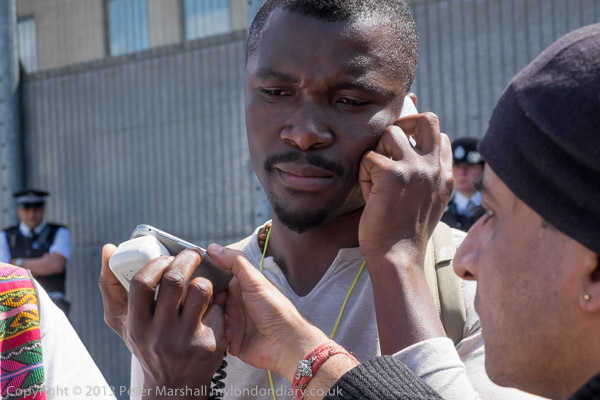 One of the protesters holds a mobile phone up to the microphone so that his message is relayed to the protesters, while the man holding the microphone is also on the phone to another man inside the detention centre who will be heard later. As well as trying to show this, I also wanted to show that the protest was being watched by police, standing back against the tall fence surrounding the prison. Above the 10ft or so of metal sheet is another 10 ft of stout wire mesh, topped by razor wire, ant through this mesh you can see the windows of the detention centre. 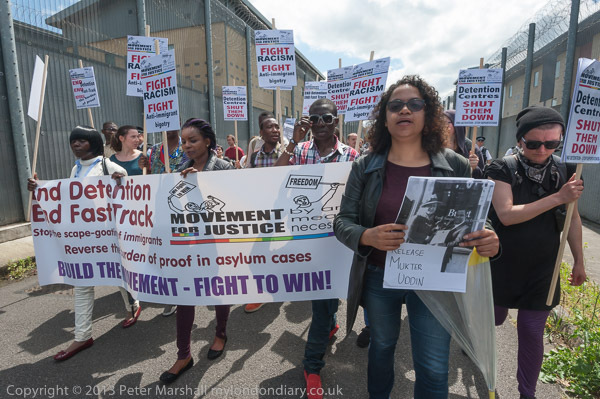 The protest had begun on the main Bath Road – the Harmondsworth and Colnbrook immigration prisons are just on the north edge of Heathrow. 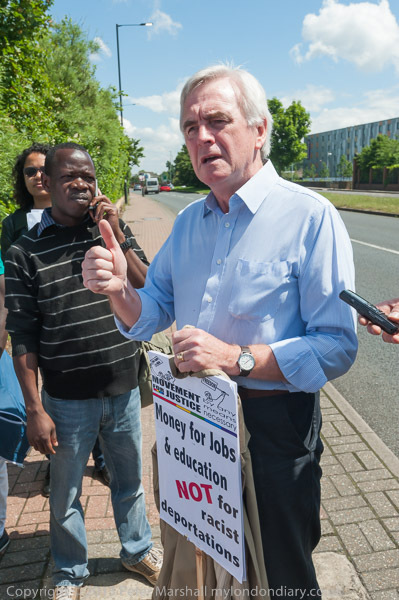 The local MP, John McDonnell, had come to express his support for the campaign to end ‘fast-track’ deportations – a method designed solely with the aim of deporting asylum claimants before they have time to put a case together to be allowed to remain – before leaving to speak at an event in central London. Police had come and asked the protesters what they intended to do, and although there was considerable reluctance to talk to the police – or for anyone to say they were organising the protest – had made it clear that so long as the protesters simply walked around an made a noise they would “facilitate their protest.” And at least for the hour or so I was there they simply followed, watched and wrote in their notebooks. And the people – around thirty of them – certainly did make a lot of noise, shouting, whistling, banging pots and pans and using the megaphone – and the response came back from inside, with men in both Colnbrook and Harmondsworth centres (the two are separated only by a roadway the protesters walked down) obviously very pleased that someone in the world outside their prison cared about what was happening to them. Some were able to come to the upper window and press their faces and hands to them. Some held up their prison ID cards, others wrote messages including their phone numbers so those outside could contact them. The windows were high up and some way away, only visible through the wire mesh, and it was difficult to photograph them. Autofocus failed dismally, focussing on the mesh fence or simply hunting. I tried the 18-105mm DX on the D800E (27-157mm equiv) and the 70-300mm , mainly on the D700. Working with manual focus isn’t too great on either lens – they and the cameras are designed for autofocus and it was actually very hard to tell the exact point of focus. Most of the pictures I made were at least slightly unsharp, but I’d realised this was likely to be the case and had taken far more frames than I usually would. The images after post-processing are far clearer than when I was taking them. When the protesters went around to the west side of Harmondsworth things were a little easier, as by moving to the back of the car park I could see the upper windows over the top of the razor wire. But these are from quite a distance, severely cropped from the original images. The strongest images were still I think some I made through the wire, with one of the men inside making a ‘V for Victory’ sign. The post-processing needed to get these images was extensive, including a large increase in contrast – not least because the windows are not very clean. Quite a lot of work with Lightroom’s Adjustment Brush was needed. The colour is certainly not very accurate, and in My London Diary you can see some fairly similar images from these window pictures where I’ve done more or less work and ended up with some quite different-looking colour. I wasn’t entirely clear about my legal position in making these pictures, but I had no doubts about the moral position. 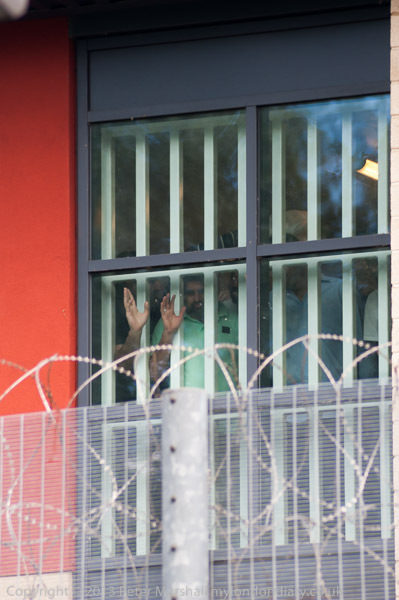 These men clearly wanted to be seen and to be recorded, and there is a clear public interest in what is happening inside these centres – which you can read more about in Support Detainees in Harmondsworth. Killip, a professor of visual and environmental studies at Harvard where he has worked since 1991, has deliberately chosen to keep his photographs so far as possible away from the web – as his own web site clearly shows. I’m sure too that he could have done far more to make his work available in print. You can see an illustrated review of his Seacoal (apparently still available) on The Photobook, a three pictures from our ridiculously small Arts Council Collection in the UK National Archives, and rather more in various exhibition listings and reviews. You could also try a search using his name on Google Images, though as always not all the pictures this returns are by him. Thanks to PetaPixel, and the short post Chris Killip, (mainly as it makes clear an excerpt from an Aperture interview with him) linking to a note in the NYRB, I’ve just been watching a short film, Skinningrove, with Killip speaking about and showing his work from this small North Yorkshire, fishing village. It’s well worth watching. One of the pictures shows a secondary teacher with boys sketching on the beach, and Killip says that he is actually a photographer, who has to teach for a living, and names him as Ian Macdonald. You can see some of his work on Amber Online. *The paperback edition of ‘Isle of Man’ is likely to cost you £250 or more, with the hardback being rather more. I think ‘In Flagrante’ may cost around the same. There is also a study of ‘In Flagrante’ available from Errata Books rather more cheaply. It isn’t easy to make a living as a photographer, and certainly I don’t think it is getting easier. As the basics of photography get every more simple there are more and more people who can and are doing it. Not in the main doing it very well, though some of the worst photographers I know are probably among those who make the most money. And some of the work given away for free by ‘amateurs’ is often visually and technically of a very high standard, while the media is full of routine clichés by professionals – who produce these because the media demands them. I’ve seldom if ever “worked for free” for commercial media. A few features about myself and my work where I’ve thought the publicity was worthwhile, but otherwise I’ve always asked for normal rates or let agencies do so on my behalf. There are a wide range of borderline publications which I know are run on shoe-string budgets, some with those publishing them dipping into their own pockets to do so where I’ve accepted reduced fees and even – for causes I support – worked as a donation to the cause. But I regularly get requests to use me or my work for nothing – and equally regularly either simply ignore them or turn them down. This blog – and my own web site, My London Diary, is largely a labour of love. There is no direct financial return as I decided to keep both free of adverts (I think there is one – or perhaps 2 – sponsored links somewhere on the thousands of pages where I succumbed to a little easy money which seemed to come totally without strings.) When I started both of them I was writing for a commercial site where intrusive advertising annoyed many of my readers – or at least those without the nous to install pop-up blockers and the like and it was something I wanted to avoid. Of course you will notice on both sites there are links through which anyone can buy prints, books and licences to publish images, but these result in relatively few sales, though there certainly have been other benefits from my work on the web. But essentially it is a way to reach an audience – the last time I checked the statistics around 10,000 viewers a day across all of my web sites – rather than to make money. I’ve been thinking for some time about writing a post about the economic realities for photographers, and have just come across an article Surviving in the New Economy by Joey Terrill on PetaPixel (originally published in Terrill’s The Penumbra Project) which says many of the things I’ve been thinking (and more) and puts them rather better. It’s unfair to summarise a long, well-crafted and thoughtful post in a few words – better you go and read it. But central to it is the truth that photographers are not going to change the media business by moaning. If you are standing shoulder to shoulder with 19 other photographers all making basically the same picture photography becomes a commodity that sells largely on price, but if you produce unique images that people want you will be able to command sensible rates for them. Many of the best photographers in the past failed to make a living from photography, and others didn’t really try. Some taught, others relied on family or friends to keep going, or took part-time jobs. Some made money from weddings and social photography (or fashion) to be able to continue to photograph the things that really interested them. I’ve been away for a few days taking a holiday, and although I made a few posts while away, wasn’t able to keep up with my normal schedules. So it’s been a little longer than usual since my last post. I’m now back and working, and keeping rather busy – so many protests now in London. In the week I was away there were at least 20 I would have liked to have covered. 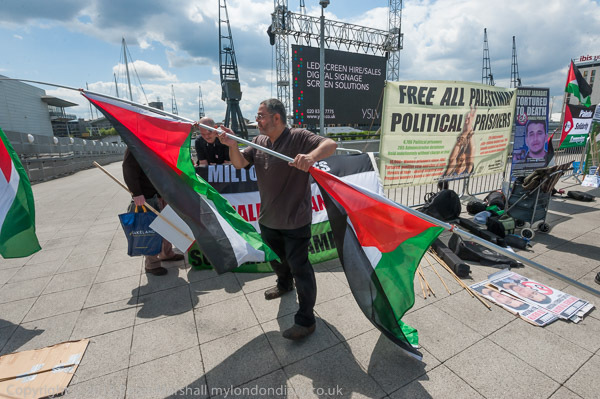 June too was a busy month, and although Thursdays are not usually very busy for me, on 5th June I went out with four events in my diary, spread across London, the first at the Excel Centre on Victoria Dock in Newham, East London. 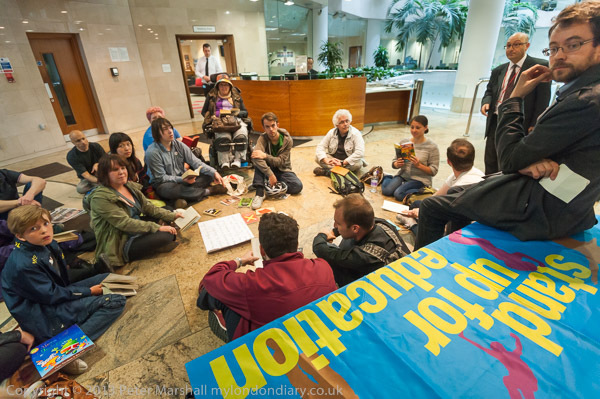 I arrived as the protesters were setting up on a paved area outside the centre where G4S were holding their AGM, and the protesters were hoping to lobby the shareholders coming for the meeting. Quite a few of the protesters were familiar to me from a number of earlier protests outside the G4S offices on Victoria St, where there have been regular protests, but there were also some other groups involved, including War on Want and Right to Remain as well as another group I’ve photographed at many events, Global Women’s Strike. 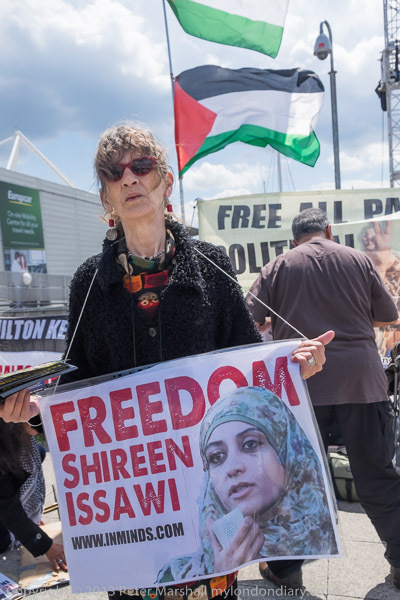 G4S’s involvement in Israeli prisons where Palestinians are held without trial and tortured and here in the UK where they have run detention centres and done the dirty work for the UK Borders Agency – including killing Jimmy Mubenga while forcibly deporting him – have rightly enraged many. 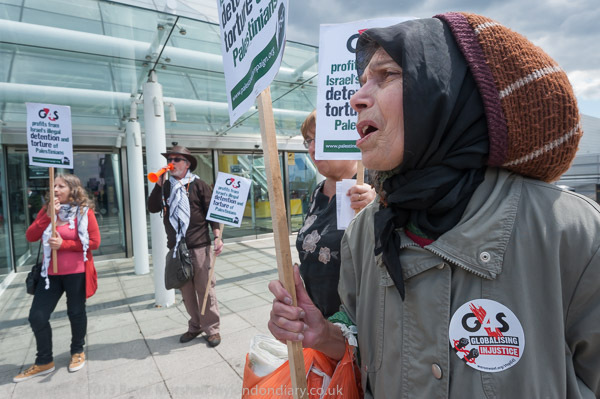 You can see more pictures at GG4S AGM Protest Against Human Rights Abuses. I didn’t stay very long although I knew that things might get more interesting later on inside the actual AGM because I knew that I had no chance of photographing inside there. 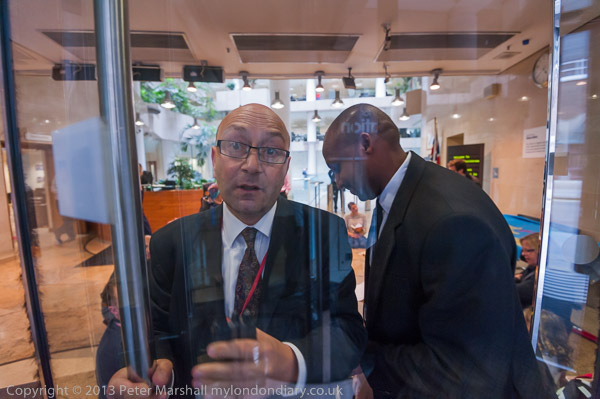 I knew the security would be very tight – and in the event when shareholding protesters were physically ejected from the meeting they even managed to stop those who tried to take pictures on their phones. I’d been a little worried before I arrived that there might be problems outside with security, as the whole area is I think part of one of London’s many areas open to the public which is actually a privately owned estate. But although there were a few minor words with the protesters who strayed outside the area that had been allotted to them, I had no problems at all in taking photographs. Fortunately it was a direct journey on the Docklands Light Railway to Tower Gateway and then a ten minute walk to the St Katherine’s Dock Practice where the ‘Nye Bevan’ march to ‘Keep Our NHS Public’ was starting its tour of the surgeries in Tower Hamlets. The removal of the minimum practice income guarantee (MPIG) for practices threatens the future of high quality health care in deprived areas – and is designed to put quality practices out of business, replacing them with surgeries on the cheap operated by large healthcare companies on the behalf of shareholders rather than patients. The march stopped briefly at each surgery for short speeches and collected a few more people. The bright sun made for some very contrasty lighting in some pictures and I often didn’t use fill flash when I should. I was also getting uncomfortably hot marching around the city streets but stayed with it for around a third of its long route to a final rally. 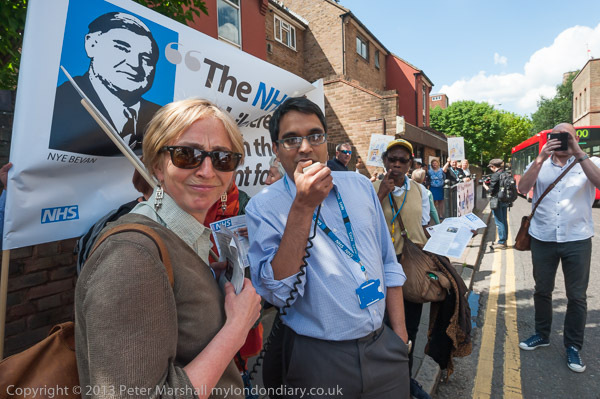 You can see my pictures at Tower Hamlets – Save our Surgeries. Possibly the surgeries will be able to hang on until after the election, when if Labour are elected there is some small chance that they might reverse some of the more blatant privatisation of the NHS as they have fewer vested interests in healthcare companies. I left the march as I had planned at at a surgery close to Whitechapel station. I should have had plenty of time from there to take the Underground to either of the two remaining protests on my list. 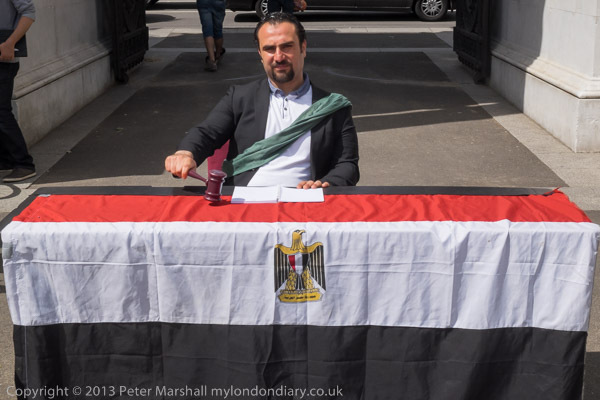 Both were in west London, at the Columbian and Egyptian embassies. But the NHS protest had taken a little longer than they had planned to get to Whitechapel, and I was running a little late on my schedule. 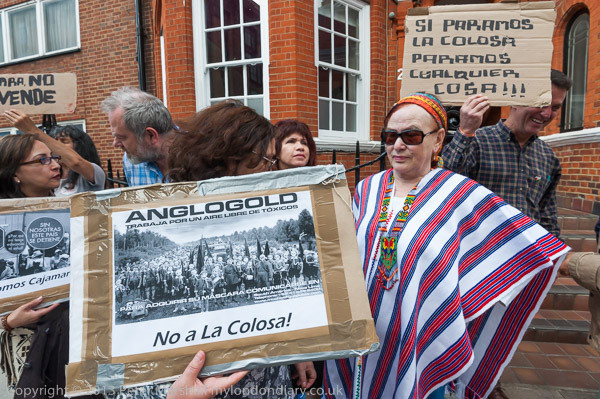 I knew I should go to the Egyptian embassy first, as the group at the Colombian Mines – World Environment Day protest would I knew be slow to start, but I chose this first as it was only a short walk from Knightsbridge station, while if I went to the Egyptian embassy I would have a longish walk there and back to the tube to go on to Knightsbridge. It was hot and I was tired and I took the easier route, and then went back to Hyde Park Corner station to walk to a protest against the Egyptian regime. This final event in my diary for the day had been scheduled by the organisers to run from 4pm until 6pm. I arrived at 5pm, meeting a familiar face who had just arrived struggling with a large and heavy trade union banner and we were both disappointed to find around 20 protesters packing up and leaving an hour early. So I had nothing to photograph. Though by then I was hot and tired and wasn’t too upset to have a little less work to do when I finally got home. It did mean I got to bed before midnight. You are almost sure to be aware that there is a photo festival every year at Arles. 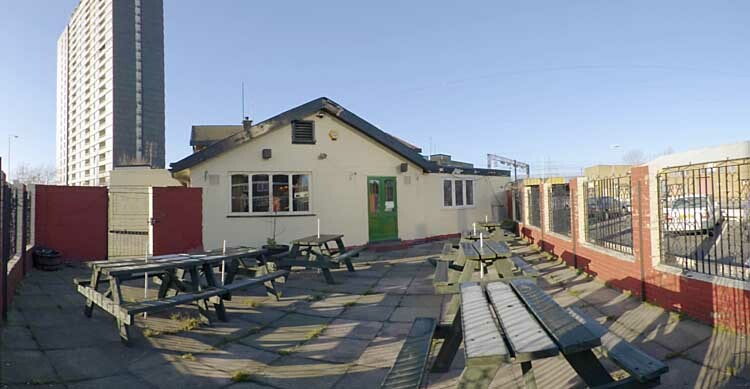 I’ve never been to it, though I’ve occasionally commented on what happened there, and have written about why I’ve not gone on several occasions. But rather than do so this year, I just want to refer you to a post on l’Oeil de la photographie Arles 2014: An Off Year? Worse—A Disaster!. That this is happening to the fringe is good in some ways – and particularly good for those photographers taking part. If you look at my reports on the several Paris Mois de la Photo I’ve attended I’ve written for this site you will have hear my thoughts that the activities on the fringe are generally much more interesting than the relatively few shows of the actual Mois, and certainly from the delear’s festival few days at Paris Photo. and he talks about the wild passions and outsized egos of recent years. I’m not sure I agree when he says that one day we will want to revisit these – perhaps we will want only to revisit some aspects of some of them, and there are other parts we will want to bury our memories of. Well there are some of Depardon’s images I’ll be glad to see again, the garden gnomes are perhaps not among them, and although I admire some of Parr’s work, too often he appears to be trading on his reputation rather than than producing anything of great import. I’ve yet to see anything by Lacroix I’d want to revisit, but hopefully he will in time prove me wrong. But somehow I hope that festivals like Arles which have such an important place in photography would become in some way more democratic and more varied – perhaps with the official festival becoming more like the fringe. As well as the editorial there are of course other reports on Arles, both on the l’Oeil de la photographie and elsewhere, so you can read these and make up your own mind. The Guardian has a video review which seems to me to underline the vacuity of the event, and a set of the ‘finest shots on display in Provence’ which suggest that the best work was from the 1950s in Chile or perhaps a little later in with John Davies’s Elf Services, Autoroute A26, Nord-Pas-de-Calais (1988). It’s hard to believe there has been so little of worth produced in black and white (the theme of this year) since then. Actually we know this isn’t true. Though perhaps it is worth asking why anyone should work in black and white now, when so many of the reasons we chose to do so in the past have gone. It’s perhaps relevant in this to point out that Peter Hugo’s slightly odd heads and shoulders images were actually taken in colour, then converted to bring out the melanin to black and white in Photoshop. And most of today’s black and white images were actually taken in colour, their conversion to monochrome more a stylistic fad than anything else. I spent over 30 years working in black and white, thinking in black and white, as my primary medium. I worked in colour too, often only doing so for images where colour seemed particularly significant or indeed the subject of the image – I was certainly a colourist at heart in my colour work. Few if any photographers now seem to think in black and white. My own approach to colour has changed too, and I’m not sure I could satisfy myself with monochrome except for the very occasional image. I was not sure what I was going to find when I arrived at the Department for Education. A day earlier I’d read an invitation from some London teachers to a protest there against the political interference by Education minister Michael Gove in the teaching of GCSE English, where he had called for changes which resulted in the removal of some of the more popular works from the syllabus – and the exam board had danced to his tune. The works that have been removed were 20th century works written by Americans, and included ‘To Kill A Mockingbird’, ‘The Grapes of Wrath’ and ‘The Crucible‘. Gove’s changes called for a syllabus that centred on British English writers and avoided these more recent and more political works. I’d come with a colleague who I’d met up with at the previous event and had told him I was going to the DfE. He walked in after me, and while I made my way into the group he stood by the doorway. I was a little surprised that the security men at the back of the foyer had taken no notice as we walked in, but after I’d been taking pictures for half a minute or so saw that they were ushering my friend outside. The lesson was then interrupted by one of the security men shouting across in my direction that photography was not allowed. There didn’t seem any good reason to stop, and I was sure there was a clear public interest in reporting the event, so I ignored him. After all, it’s rude to shout, so I just felt a little selective deafness occuring. The floor was crowded with the people sitting down for the lesson, so it took him a little while to reach me as I continued to take pictures. His senior colleague came at me from the other direction and together they ushered me out very politely. They had done their duty, though I don’t think their heart was in it, and I had done mine and it was all very civilised. 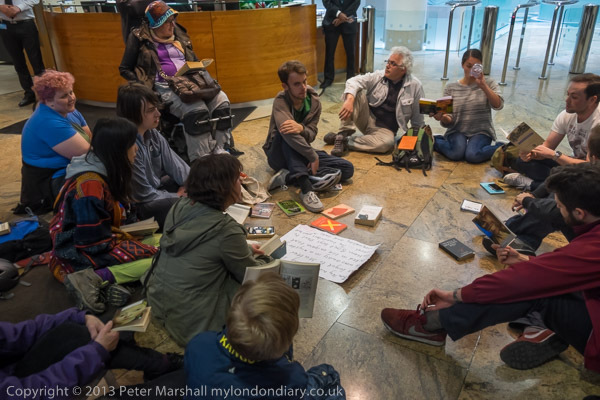 I would have liked to have had a few more minutes to work – time to think more about the pictures – to get some where the ‘banned’ books were more visible (one is rather small in one image) but they were enough to show the event. And they shut the door in my face as I’m still taking pictures. 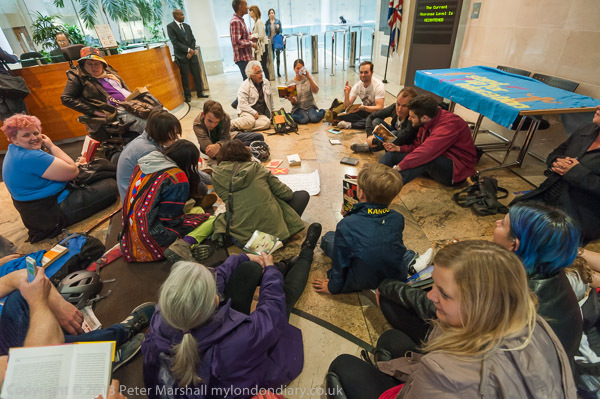 You can see the set I took at Gove “Read-In” protest in DfE. You are currently browsing the Re-photo blog archives for July, 2014.